Two Key Candidates Barred From Seeking Iran's Presidency : The Two-Way The Guardian Council, which vets all candidates, approved eight names, but left out an influential former president and a top aide to the current president. Their exclusion gives establishment-friendly candidates a clear path to the presidency in the June 14 election. 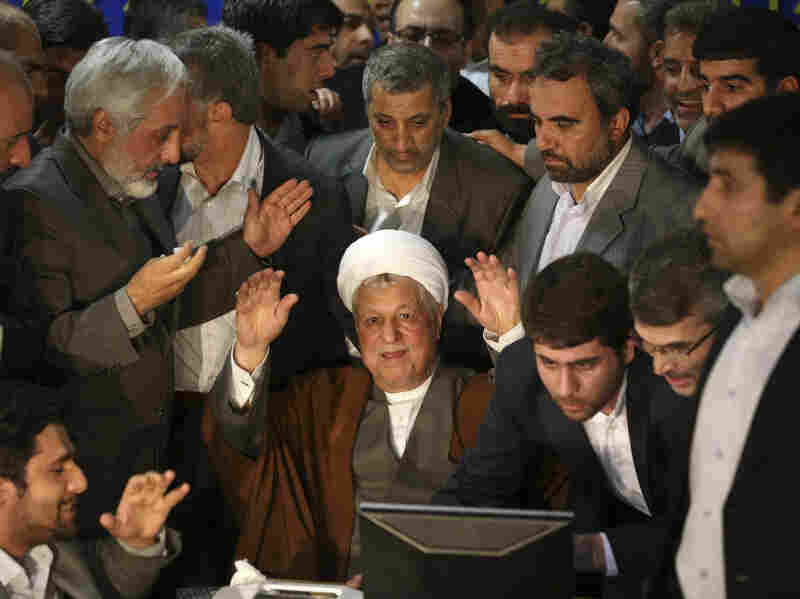 Former Iranian President Akbar Hashemi Rafsanjani's candidacy for the country's presidency was rejected Tuesday by the powerful Guardian Council. He's seen here on May 11 registering his candidacy for the June 14 election. Iran's powerful Guardian Council has disqualified two key candidates — a former president and a top aide to the current president — from running in the June 14 presidential election. The Guardian Council, which vets all candidates, approved eight names Tuesday but left out former President Akbar Hashemi Rafsanjani and Esfandiar Rahim Mashaei, who was handpicked by President Mahmoud Ahmadinejad. Mashaei said he would appeal the decision to the country's supreme leader; Rafsanjani did not comment. "There have been wide speculations that Mashaei would be excluded from the list. But not Rafsanjani, a two-term president and current head of the Expediency Council, a position appointed by Ayatollah Ali Khamenei, the Supreme Leader. "Their exclusion from the June 14 presidential ballot gives establishment-friendly candidates a clear path to succeed Ahmadinejad, who has lost favour with the ruling clerics after years of power struggles. "It also pushes moderate and opposition voices further to the margins as Iran's leadership faces critical challenges such as international sanctions and talks with world powers over Tehran's nuclear programme." As NPR's Peter Kenyon reported last week, nearly 700 hopefuls had thrown their names into the race. "Although not exactly a free-for-all, analysts say, there's a clear sense that Supreme Leader Ayatollah Ali Khamenei has failed to unify the political elite behind a single establishment candidate, Peter reported. "Mahmoud Ahmadinejad, the country's embattled president, is barred from running for a third consecutive term — though he continues to try to influence the field, throwing his weight behind his own handpicked candidate." The Guardian Council also rejected the candidacies of all female candidates — about 30 in number. "Just one approved candidate, Mohammad Reza Aref, might draw some moderate appeal because of his role as vice president under former reformist President Mohammad Khatami. "The rest of the choices, at the very least, would create a possibly seamless front between the ruling clerics and presidency after years of political turmoil under Ahmadinejad, who tried to challenge the theocracy's vast powers to make all major decisions and set key policies. Iran's presidency, meanwhile, is expected to convey the ruling clerics' views on the world stage and not set its own diplomatic agenda."